Arulco Revisited for Jagged Alliance 2 v1.13 was created by JAsmine and Beka and first released in early 2012. The mod's main goal is to make the game more diversified and balanced. 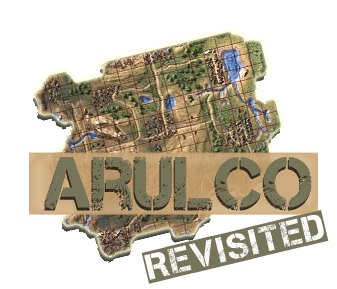 The mod changes or replaces every sector map in Arulco and tries to make the country (and thus the whole game) more interesting in general, hence the name "Arulco Revisited". Furthermore, this mod encourages you to play a "live of the land"-style game. There are some more features, check them out below. [color:#FF0000]Installation instructions and additional information are included. Be sure to read Arulco Revisited.pdf! All you really need is a working installation of Jagged Alliance 2 v1.13. Jagged Alliance 2 v1.13 stable rel. 4870 is recommended (download from JA2 v1.13 wiki). Official bugfixes for the stable release are fully compatible and should be installed, too. Unstable v1.13 revisions might work but aren't fully supported at the moment. Older stable v1.13 releases < 4870 might work (if they aren't too old) but aren't supported. The following localizations are fully supported at the moment: English, French, German and Polish. Others might work but are untested. Very good. A nice surprise. And clever timing to "battle" BiA. Dont know where to post it, so i post it here, because i encounter these problems here. That news interrupts system is odd. I get interrupts from mercs and they didnt even see enemies. BTW, I took as usual Barry... Mechanical 44? Also every time i start the game is get this error report, even in the DATA_AR/JA2_Option.ini they are already there. 1) Which version of v1.13 are you using? 2) Which other mods are you running besides AR? 4) The wall of red error text you're getting is because the game looks for some INI-options that aren't present. The INI which is delivered with AR mod is an unmodified INI from stable v1.13 rev. 4870. 4] Thats the fun part, after igot that message i added them, but still get them. I tried everything i could imagine. Even tried to kill my IMP with mustard and leave tactical and go to another sector. Not possibel to take the stairs. Here is the save game. Anyway its interesting and fun. Normaly the 2 houses doors, close to the (original) gate, have light. This was the hard part to sneak in. Some sectors still need some fine tuning. In my opinion: you get to soon good weapons. Day 1: Heading to SamSite near Chitzena and already have a AS Val & Vintorez, both with Rod&Spring. playing this AR with the Ja2_4870_patch.exe and in estoni airport theres a ghillie helmet drop that with crash the game when you chick on it with the grab hand. stack trace at the time. Try the following and copy the extracted GERMAN.SLF file into the \Data directory of your JA2 v4870 AR install. @ JAsmine & Beka: Good to see some mod- and mapmakers are still active! Congratulation to the successful conclusion of your Arulco Revisited Mod! Waldo & his voice are not touched by AR. His missing voice must be becauce of something else. Thanks for the info with the light, will check it out! Thanks! If you feel like you're having too much sparetime - give it a try! I'm currently working on an improved version of AR mod with bugfixes, new content and balancing. 2. to install Arulco Revisited, where should extract files of AR, into root 1.13 folder, or into Data-1.13 folder? 1) Sorry, but I can't help you on this issue. Maybe post this problem in v1.13 forums to get more attention?! 2) Copy all the files & folders of AR mod directly into your JA2 root-directory. No files will be overwritten, folders will be 'integrated' into existing folders. 2a) Read the readme included in the docs folder for more information on how 2 run the mod and stuff. If you can't run the INI editor, you won't be able to select AR as the mod you want to use. This is 'brute force' method and NOT recommended (but works). Better get the INI editor to run. No need to go bruteforce, you can just set the vfs config by hand. Save the file and run, I never use the IniEditor. So , this done yet ? @ Marko , good to hear from you again ! Good to hear that the mod runs fine. I hope you'll enjoy it! The development of the new version is 90% done at this point. The remaining 10% is reserved for small changes that might occur because of the tests that the new version undergoes at the moment. We don't consider this a beta version, so we try our best to test it before releasing. There will be some bugfixes in the new version. However, none of the bugs present on v1.0 are game-breaking or of a serious nature. Most of the fixed bugs fall under the category of "annoyances". There will be some new content (additional new maps) in the new release, but not too many. The main aspect of the new version will be better balancing. Remember: In AR mod, Bobby Ray comes into play in a different way than in normal JA2. Loot and enemy drops are way more important. I will most probably take just a few days before the new version of AR mod will be released. I just downloaded and installed this mod and I am rather excited! I do have a question about customizing the mod since i'm a noob at this stuff. I'd like to know if I change the various settings in the JA2-Options Wordpad document found in the Data-AR folder or do somehow have to modify the settings in the INI-Editor? you can edit the Ja2_Options.ini with the INI editor, by hand or with a good tool like e.g. notepad++. Don't use wordpad. I would recommend using the INI editor, but thats a personal opinion. Make sure you follow the installation instructions of the mod (set "vfs_config.AR.ini" as the selected mod). And also be sure to edit the ja2_options.ini inside the Data-AR folder (not the one inside the Data-1.13 folder). You might want to create a backup of the file in "clean" state, just in case you mess something up. You'll need to start a new game for some (most?) of the settings in ja2_options.ini to work properly. What a great surprise! Thanks everyone! hehe, thanks. Most mapping was done by Beka. Some of the "new" maps in the mod are modified versions of maps from other authors (see credits in the readme). Yo JAsmine, Is Perko (dude who loses shipments) missing from Drassen airport? Yo lockie, Do you want me to edit the first post? The wallet fits into the gun sling slot, not sure if that was intended. I freed the airport, Bobby Ray's is still "under construction". (Was I supposed to read instructions? Does this work differently here?) I also freed the SAM site, still no BR. @Dieter: as shipments no longer arrive in Drassen in AR - yes, the guy handling shipments is no longer located in Drassen. Pablo is missing from Drassen Airport. That's true. But he is still in the game! Btw, Perko is the guy repairing stuff in Cambria. Items are not changed by AR mod (to make the mod compatible with other item/weapon mods out there), this must be an issue of v1.13. This is not an error, it is intended. Bobby Ray works differently in AR! You shoul really read the instructions or even the beginning of the RIS report. Enemy drops are not changed by the AR mod (again, to maintain compatibility with other item/weapon mods). But there is glaser and match ammo to be found in sectors like Omerta and Drassen (because thats IMO the point of the game where you need that kind of ammo). Is it possible to use just the new maps, and not actually change the way the rest of the game works? detailed answer: If you know what you're doing, you can of course try to exclude some parts of the mod and use only certain other parts of it. However, using just the maps and nothing else was not intended by the creators and won't work without some more "messing around" by you. The point is: The content of this mod apart from the maps was developed to fit to the maps. So, if you exclude some parts of the mod you might get undesired results and you will definitely miss the experience of this mod as it was meant to be. I recommend not to try and "use just the maps". possible compromise: As I've stated before, the content of this mod is like 90% about new maps. The only significant change apart from the new maps is, that Bobby Ray will be available later and you as the player will live "off the land" for longer than usual (which is a lot easier in this mod than in stock v1.13!!). Think about it, the way the game works is almost untouched and you will be given the opportunity to employ a new strategy in the game. Maybe you should just give it a go and maybe you will like what you see? But in my opinion, aspects like "more enemys" count towards "new/changed maps", since the enemies are part of the maps. Apart from that, more enemys do not make the game significantly different, they will "just" lead to longer and maybe tougher battles and usually more loot. Hmm , seems like elites very early on ... ? And me with pistols and a couple of damaged rifles . Ohhh , the challenge .. But it's true... this mod is more challenging than stock v1.13. And it's meant to be that way! btw, lockie, which difficulty level did you choose? Yup, some okay pistols and a lot of jammed pistols lol where are the good guns?! But at least the locked crates open almost immediately with 2 or 3 shots! Ever think about incorporating Smeagol's inventory system? BR isn't in Drassen, and Pablo (and Sal) won't be there, too. Those guys are at the new location of BR shipments. However, the "get food for rebels" quest works in AR exactly the same way as you're used to it. The priest is in his usual random places (bar c13, church d13, bar d13). To be honest, I'm not quite sure what system you're talking about?! Please specify. But we've tried not to change items and aspects directly tied to items. This was done to keep this mod flexible and, most importantly, compatible to other mods (e.g. MAM, AFS, HAM5...).